Anthony Edward "Tony" Visconti (born April 24, 1944) is an American record producer, musician and singer. Since the late 1960s, he has worked with an array of performers. His lengthiest involvement with any artist is with David Bowie: intermittently from Bowie's second album in 1969 to the 2016 release Blackstar, Visconti produced and occasionally performed on many of Bowie's albums. Visconti was born in Brooklyn, New York. He started to play the ukulele when he was five years old, and then learned guitar. He attended New Utrecht High School. Throughout his teenage years Visconti was involved with both a classical brass band (playing tuba) and a traditional orchestra (playing double bass), as well as playing rock 'n' roll-oriented guitar, valuable experience which served him well in later years. By the age of 15 he focused his efforts playing in local Brooklyn bands. After leaving school he played guitar in a band called Ricardo & the Latineers in the Catskills; the band also included Artie Butler, later a leading arranger. In 1960 he played his first recording session, and over the next few years became one of the leading guitarists in New York nightclubs. He played in lounge acts including the Ned Harvey band, and the Speedy Garfin Band, before joining a touring version of The Crew-Cuts, where he met his future wife. As Tony and Siegrid, the pair released two singles; the first, "Long Hair", was a regional hit in New York in 1966, but they could not maintain its success. Visconti then became in-house producer for his publisher, the Richmond Organization. Through this, he met British producer Denny Cordell in 1968 while he was working as Richmond's in-house music producer. Cordell asked him to assist in recordings for successful jazz vocalist Georgie Fame. Visconti moved to London—in a move that would soon become career-defining. One of his first production projects in England was with the Welsh group The Iveys (later known as Badfinger). He produced several tracks for the band's first LP Maybe Tomorrow, released on The Beatles' Apple label. The title track from this album was released as a single. More early production work on the album My People Were Fair and Had Sky in Their Hair... But Now They're Content to Wear Stars on Their Brows for the British outfit Tyrannosaurus Rex (later to become T. Rex) began a relationship with T. Rex that would last for their next seven albums. One of Visconti's greatest successes was Electric Warrior, the album that made T. Rex frontman Marc Bolan a superstar and cemented Visconti's producing prowess. He produced the first two albums by influential progressive rock band Gentle Giant. Shortly afterwards, Visconti began to work with David Bowie and, along with guitarist Mick Ronson and drummer John Cambridge, formed and toured with the band The Hype in which he played bass. Although the band name would be very short-lived, the line-up persisted and would go on to record the seminal album and single The Man Who Sold the World in 1970. He would further go on to work on the albums Diamond Dogs (1974), Young Americans (1975), Low (1977), "Heroes" (1977), Lodger (1979), Scary Monsters (And Super Creeps) (1980), Heathen (2002), Reality (2003), The Next Day (2013) and Blackstar (2016). He did orchestral arrangements (but not the production) for Paul McCartney and Wings' 1973 album Band on the Run. Visconti would produce two full albums for the Moody Blues, The Other Side of Life (1986), and Sur La Mer (1988). In 1990, he produced several tracks on the Moody Blues' Keys of the Kingdom album (1991), Luscious Jackson's Electric Honey, Leisure Noise by Gay Dad, Soul Caddy for Cherry Poppin' Daddies and Dawn of Ananda for Annie Haslam. In 1997, Visconti produced the debut album of The Stone Roses member John Squire's new band, The Seahorses entitled Do It Yourself. In the 2000s (decade), Visconti renewed his association with David Bowie, producing the albums Heathen in 2002, and Reality in 2003. These two albums hark back to his Berlin production work with Bowie. He produced and played bass on a handful of tracks from The Dandy Warhols 2003 album Welcome to the Monkey House. In 2003 he teamed up with the Finn Brothers (Neil and Tim of Crowded House and Split Enz fame) to record and produce their second collaborative album, eventually released in 2004. In 2004, he produced three songs on the Manic Street Preachers album Lifeblood. In 2005, he collaborated with Copenhagen band Kashmir, whose fifth album, No Balance Palace, featured David Bowie. He has also collaborated as co-writer and producer on the album project by Richard Barone. He worked in Rome and produced the #1 UK album by Morrissey, Ringleader of the Tormentors. His autobiography, Bowie, Bolan and The Brooklyn Boy, was published in February 2007 by Harper Collins UK. The imported soft cover version is now available in the United States. The book has been translated into French by Jérôme Soligny as Tony Visconti Bowie, Bolan et le Gamin de Brooklyn, published by Tournon. In 2007 and 2008, Visconti was very active in the studio with Benin singer Angélique Kidjo, producing her Grammy-winning album Djin Djin (Razor & Tie). Guests artists include Alicia Keys, Peter Gabriel, Joss Stone, Josh Groban and Carlos Santana. He has also produced two albums at Saint Claire Recording Studio in Lexington, Kentucky: The Bright Lights of America (RCA) by Pittsburgh punk band Anti-Flag and an album by Alejandro Escovedo called Real Animal (Manhattan Records) released in June 2008. He produced the new No. 1 album (in France) by French artist Raphael in Paris and New York. He produced and mixed Kristeen Young album Music for Strippers, Hookers, and the Odd On-Looker, released in 2009 and arranged Fall Out Boy album Folie à Deux. 2010 marked the release of Richard Barone's Visconti-produced Glow album, which includes five songs co-written with Barone and a remake of T. Rex's Girl. He also played bass, guitar, synth, and Stylophone on the album and performed live in concert with Barone on numerous occasions. Visconti produced the David Bowie album, The Next Day, and remixed and remastered both The Slider anniversary box set (Demon UK) and Electric Warrior 40th anniversary boxed set (Universal UK) by T. Rex. In 2013, he produced Solar Secrets by Capsula. In 2014 Visconti produced and arranged several tracks on Marc Almond's album The Dancing Marquis. Almond has wanted to work with Visconti since hearing some of Visconti's earliest production work with T-Rex and David Bowie, stating "It was a dream to work with Tony". Visconti produced Bowie's final album, Blackstar, released on January 8, 2016. After divorcing his first wife Siegrid, Visconti married Mary Hopkin in 1971 before divorcing in 1981. The pair have two children, musicians Jessica Lee Morgan and Morgan Visconti. He married for a third time, in 1989, to May Pang, with whom he had two children, Sebastian and Lara, before divorcing in 2000. Visconti played bass on David Bowie's 1970 album The Man Who Sold the World. In 2015 and 2016 he toured the UK, Japan and the East Coast of the USA with the Bowie tribute band Holy Holy, playing the album in its entirety and other early Bowie classics, along with the album's original drummer Woody Woodmansey and other well known musicians. The Autobiography: Bowie, Bolan and the Brooklyn Boy. New York: HarperCollins, 2007. ISBN 978-0-00-722944-4. With a foreword by Morrissey. ↑ Stars of David: Rock'n'roll's Jewish Stories – Scott R. Benarde – Google Books. Books.google.co.uk. Retrieved 2014-03-11. 1 2 Tony Visconti: the Autobiography: Bowie, Bolan and the Brooklyn Boy – Tony Visconti – Google Books. Books.google.co.uk. Retrieved 2014-03-11. 1 2 Ankeny, Jason (April 24, 1944). "Tony Visconti | Biography". AllMusic. Retrieved 2014-03-11. ↑ "Richard Barone – Bar/None Records". Bar-none.com. Retrieved 2014-03-11. ↑ Jade Wright (31 January 2014). "Say hello again: Mark Almond on how Merseyside roots inspired forthcoming album". Liverpool Echo. Retrieved 10 April 2015. ↑ Hiatt, Brian (January 13, 2016). "David Bowie 'Thought He Had a Few More Months,' Says Tony Visconti". Rolling Stone. Retrieved November 21, 2016. ↑ "May Pang is a legend in the Rock n' Roll world". Asiancemagazine. September 1, 2003. Retrieved June 9, 2011. 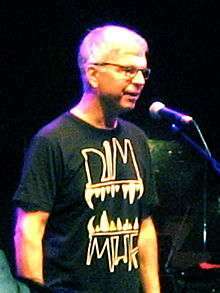 Wikimedia Commons has media related to Tony Visconti.